Ladies, ladies, ladies. How our departure from one another was almost unbearable. Did we have a wonderful weekend? I certainly hope so. I am spending Monday morning with some serious allergies and being severely sore due to back breaking yard work yesterday. I know. The thought of me doing manual labor all day is absolutely unnatural and hilarious. Trust me. My neighbors thought so as well. On my last yard waste bag (one of about 32), I happened to find that the bottom of it was ripped. I then proceeded to kick the bag around the yard to show it what for. I am positive my neighbors were thoroughly entertained. Needless to say, yard work is not my jam. What is my jam, is the after product. Ooooh and ahhhh. That instant curb appeal that a little raking, mowing, mulching and planting gets you, almost makes all of the pain worth it. Almost. 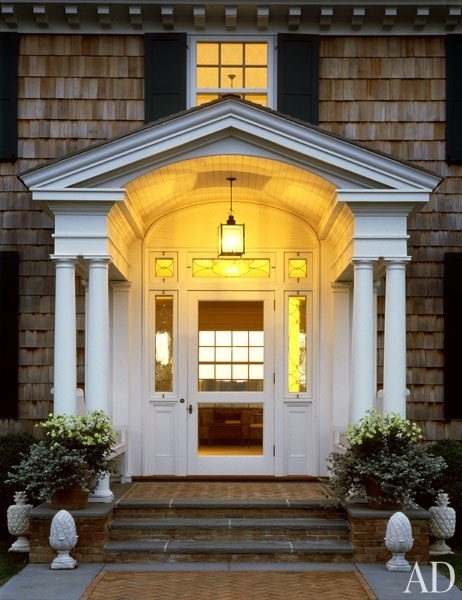 Let's look at some porches with some major curb appeal. I mean magical, right? A little fern, some perfectly trimmed shrubbery and call it good. Many thanks to my mom and sister for toughing out me being completely clueless to anything landscape related. While everything is still not finished, it is off to a terrific start. Here is a little sneak peek. Looking good over there. I still haven't planted my front porch containers. I am thinking red flowers but who knows. This makes me want summer to get here ASAP. Like, yesterday! I'm so ready to plant and breath some life into my facade! Looking good, what's on the planting plan? Love it!!! Love your door!! We've provided some entertaining moments for our neighbors as well in the past with our yard work antics; good times, huh? At least the weather is Richmond was bee-u-t-full this weekend, we did some yardwork too. You are the best color picker, your front door is a gorgeous coral ... have you posted the color's name? I need a great coral for my foyer and your door color could be it. 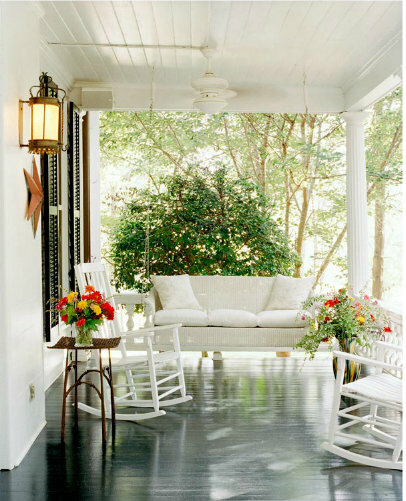 I want to redo our front porch so bad. Love your bright door it makes me happy everytime I see it! I love your bright door, it is so welcoming! We will have to do progressive dinner/drinks soon so I can see your new pad! Ugh so sorry about your allergies! :( No fun! Love seeing it come together in that last photo! 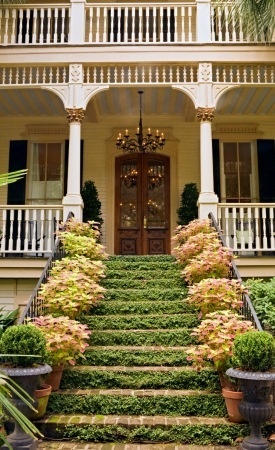 I simply LOVE porches. Heaven! Good start on yours! 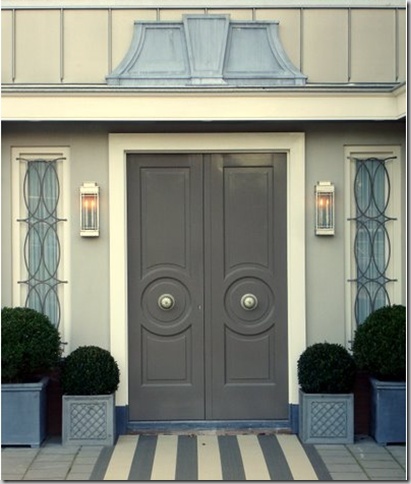 The grey doors and topiaries... droooooooool! Looking good sister! Sounds like we were doing the same thing all weekend. I have been watching Doug do a lot of yard work lately. It looks painful. I am usually supervising. 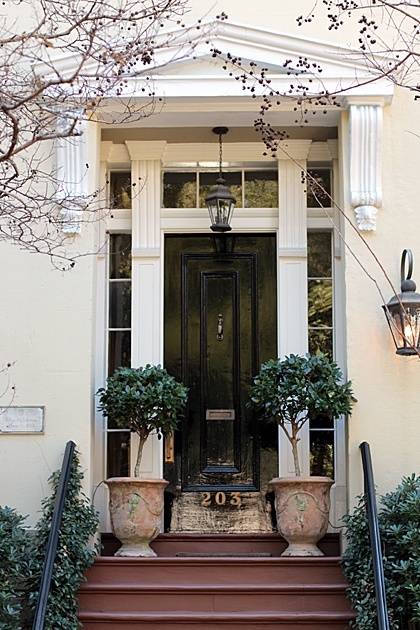 Love the front door! Props for getting a little dirty! I can't stand yard work and often leave it to my guy...but definitely want to start to do some planting and things, so you may be my inspiration to do it myself! Yard work is seriously back breaking work! I pulled out the bushes from like a 10 foot by two foot section of my yard last year and I could barely move the next day. To put the cherry on top of all my hard work, I didn;t water all the flowers that I put in place of the bushes and everything died. I've given up on yard work since then. GORGEOUS!! I am in porch heaven...love every single one! I could die for that gray door!! Why don't they make doors like that anymore!?! Love the ivy (if that is what it is in my not so trained green thumb eye) going up those steps. Seems so unattainable:)! 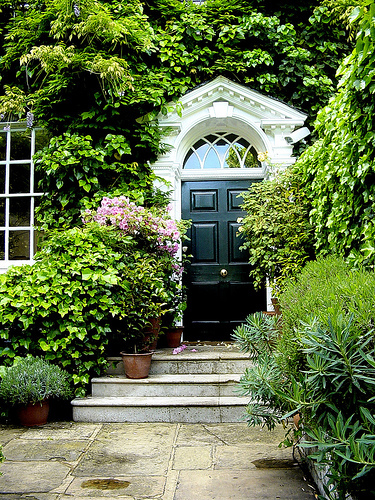 I cannot begin to imagine how to make the outside of my house look decent. Love your door:) I painted our front door red last spring and I swear it makes the house!